But are these two bones – a femur and partial pelvis – valuable natural history specimens? I’m not convinced. 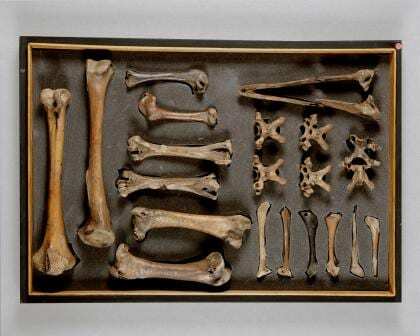 We have a spectacular collection of dodo bones at the Grant Museum – almost definitely collected by the same person – George Clarke – as the bones on sale. They are of genuine public interest – visitors always want to see them and there was real media interest when we rediscovered an entire extra tray of their bones when we moved in 2011. In my nine years at the Grant Museum I can only recall researchers wanting to use the bones for science once (and that was just to list which museums have dodo material). The added value of a single femur and pelvis to human knowledge of dodos is, I believe, limited. So if not for research, then for the public? If these dodo bones were in a museum the public could visit them and be inspired by the story. Does the public not deserve to have access to their global heritage? After all, one could argue that dodos were the first species that humans realised they had driven to extinction. To be honest, I’m not sure two extra bones would make a difference – no museum could seriously display these on their own – it would look a bit meagre. If a museum were trying to build a composite skeleton, as many have, and were missing a femur and a pelvis, then there really would be an argument for them having them. But other than that, it seems rather simplistic to say that all dodo bones should be in a museum. So why was I horrified? Treating natural history specimens as commodities to be traded like art is a dangerous game. Taxidermy is all the rage these days with hipster types, but you can pick that up for less than £100 in an antiques shop. When high-end art dealers get involved something different happens. The price of an artwork is determined by how desirable it is. How desirable something is is, arguably, determined by art dealers. When art dealers get their hands on natural history objects they work out how to make them desirable, and set their price. Being the first living person to buy a dodo bone is the kudos that this sale is surely being built on. Creating an elite market in natural history influences future sales and when material that is scientifically important comes up, museums and research institutions are priced out of the market. For example I commented for the Guardian on the story of an amazing dinosaur fossil was put up for sale for $9m – out-pricing any museum budget. In that case the specimen did have real potential value. In addition, seeing animal specimens as trade-able items creates a market that can have real impact on living species, and that could have conservation impacts. In order to insure something, museums have to put a value on it (whether natural history or art). This can be a scary process for curators. As soon as you tell your governors or council that something they effectively own is valuable enough to fund something significant the thought occurs that they might cash it in. The Museums Association strongly protests against such short-term thinking, but it doesn’t stop it from happening. Croydon Council has suffered some terrible backlashes for seeking to sell paintings from their museums’ Riesco collection. This has long been a background concern for art collections, but art was designed for trading. Natural history has largely been able to fly under the radar. While the scientific and real world value of specimens is well-recognised, it’s likely that most governing institutions assumed it was of limited financial value. If two imperfect bones could fetch £30,000, imagine what a really significant collection might be worth? It will inevitably lead to some insurance reassessment around the world. Museums just don’t need this kind of temptation dealt to their governing bodies. If the museum governors get tempted, so might criminals. Certain museum objects – particularly rhino horn – have been targeted by organised criminals, often in violent attacks. The sector has responded well with a suite of new security measures. Museums really don’t want to have to add dodo bones to objects that could attract unwanted attention. There is a counter-argument to putting financial value on objects – perhaps it’s the only value anyone pays attention to. Art collections have relatively few problems convincing decision-makers of the value of their collections, because it is readily and regularly expressed in financial terms. This isn’t the case for natural history, which can often struggle to explain why their collections need protecting. This is a sad fact. Perhaps even the natural history curators themselves will be looking at their specimens in a different light after this dodo sale. So do dodo bones belong in museums? I’m unconvinced. Some dodo bones belong in museums, but maybe not these ones. I’m still horrified that they are being sold like this though. What do you think? * This is a slightly dubious claim as part of a dodo femur was sold by Christies earlier in 2013 for £8,000. The sale of the femur discussed here is the first complete bone sold since 1934 (though it should be noted that the pelvis is not complete). I think your last point there is important. The Grant Museum is a museum of museums, containing a lot of the material disposed of by Universities when it was no longer required for teaching. Sadly, this still continues today with collections at risk or worse non museums collections being ‘given away’ to individuals. Attaching a financial value may cause non specialists to stop and think about what they are throwing away and why although as you point out collections shouldn’t be considered assets. This may be going off on a tangent (for which I apologise) but live wildlife as well as dead specimens also attracts a monetary value. This has been going on for a long time, cf. the (often illegal) exotic pet trade, but in this instance (see the news link below) it is being done in the name of conservation. Whether or not the rhino is a disruptive element, what effect do these people think that the sensationalising of an endangered species hunt will have – what sort of message does this send to the world? Not that I condone looting or any market that would constitute such activity, I am not entirely against an international antiquities market. If 2 impartial bones have no real scientific importance the question of sale is more complex. The UK exercises export and sale limitations on antiquities sale as a matter of shared heritage, do these two bones tell any such story? The status of seller is also important, if they have been legally inherited surely they constitute a possession to sell? One can question the morality of the seller, but perhaps not the legality of such an transaction. All very tricky and complicated and £30,000 sounds like a very optimistic pricing. Because they subjectively have ‘no value’ today does not take into consideration future value. New techniques and methodologies are constantly being employed and refined. What might be considered ‘insignificant’ today might be a crucial sample in the future. That is why we have museums to preserve these specimens. I see these arguments as short-sighted. Another issue is that Mauritius passed laws a few years ago banning export of dodo bones. Proving that a specimen was collected legally in 1865 and legally traded or inherited since that time would be almost impossible. Security at the Mauritius Institute has never been tight, and corruption reigns within the management (hate saying this, but it’s true I’m afraid). The site is privately owned, but Mauritian law still applies. However, other museum collections are not much more secure, and there is concern that these silly prices will tempt people to take specimens, just as with rhino horns. We don’t get regular visits from scientists working on the dodo (to be honest it’s been done to death, if you pardon the pun) but we will be keeping a very close eye on them in future. This issue is by no means restricted to the dodo- we have had megalodon shark teeth stolen too, thanks to silly prices. Museums have no doubt made this ‘wait and see’ argument for generations and we are now left with stockpiles of material that is not on display, nor being researched. If a museum were to hold on to every object that could potentially at some point or another become scientifically important we would need acres of storage space, staffing and funding. Surely, in an area where academic merit is limited it is best to, perhaps, draw a line?